Even after a lopsided victory in big match with a much-hated rival, many coaches would maintain some sense of decorum and offer empty praise for the opponent, while smugly letting the result burn in the air. Occasionally, a coach who is relatively new to his club and has been failing to maintain the standards of his terminated predecessor, despite an influx of new player purchases arriving with him, would be somewhat humbled at a big win in his first go at any particular derby. You’d think even a glory hound chasing gigs at well-moneyed clubs to maybe help mask some inefficiencies in ability might be able to play it cool. But let’s be clear . 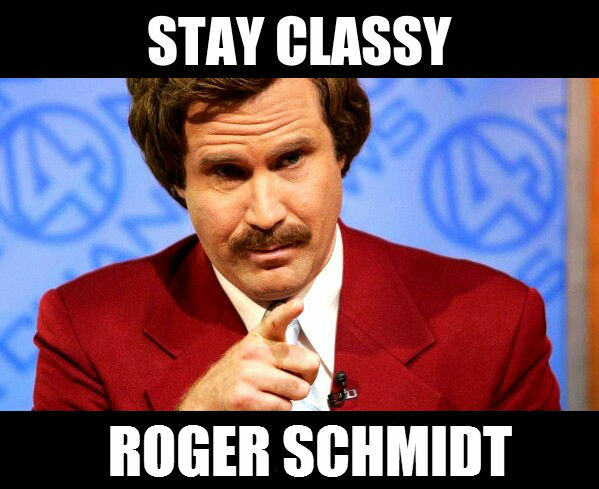 . . Roger Schmidt is none of the above. This, of course, falls under the “You only sing when you’re winning” category. Naturally, fans of the Pill Pimps would be quick to assign “sour grapes” to such a response to Schmidt’s tactless post-match commentary with regard to their opponent, perhaps also grousing about the pot-shots at their non-club spending habits/abilities and all that. Which is fine. I am “sour grapes” about a lot of that stuff, but it has nothing to do with today’s result. As such, I won’t get into it here. Suffice to say there are myriad reasons a certain type of club-seeker lands with a second-division 1. FC Köln and not the nearby perennial Champions League contestant (who was one of the contestants in my first ever football game attended, by the way). Even as frustrated as I might be with the way the club has played in an ultra-defensive posture and patiently awaiting the odd chance, it’s still infinitely preferable to compiling a roster full of big salaries and hoping some combination will finally unlock the success that will still not bring the real prize of the dedication of soulful football fans in the region. Because THAT is how the “number one on the Rhine” is adjudged, not by the scoreboard on any given Saturday, rather a plethora of much bigger parameters. That Schmidt said what he said when he said it shows that he’s completely oblivious to what is beautiful about the beautiful game in Germany’s most-beautiful city. And when you fail at Leverkusen (and you will fail because that is what people do at Leverkusen), we’ll still be here, loud and proud, regardless of whether you approve of how our club is playing on the pitch or anything else. Which, as we all know, is why you all cannot help but comment on our club in a negative manner, even when you should be relishing your own victory. It eats at you that no matter what happens between the two clubs, you’ll always be, at best, second place. So, now you know my own philosphy. Maybe your employers have a pill for it. 2 Comments on "You stay classy, Roger Schmidt!" Everyone has his opinions but did you have to be so salty? Talking about staying classy and at the same time writing a very passive-aggressive text about the oh so bad club Bayer Leverkusen, that’s not very consequent. Schmidt will fail because that’s what people do at Leverkusen? Wow, what a well investigated article. Köln is the number one on the rhine? This has nothing to do with Roger Schmidt. Absolutely nothing. Plus that’s your opinon, not a fact. I understand that you don’t like Leverkusen but this opinion should not affect your ability to write (objective?) articles. You’ve made a fatal blunder. You’re assuming this is a failure in ability to write objectively, where as this was a conscious choice. Did you happen to catch a theme in this blog, perchance?